I will sometimes get questions from members and I do my best to answer them all. This week I received an email from Tom D.
Interesting question. Many genealogy programs do this sort of thing. 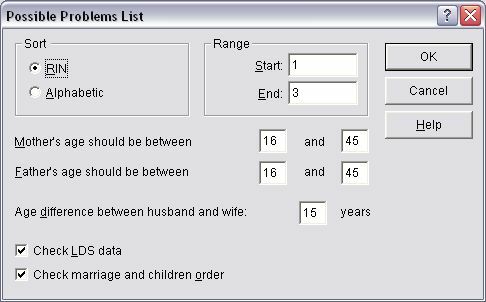 Genealogy software programs often come with data integrity checks or “possible problems” alerts. In this case, there are parameters pre-set to check if a birth fits the norms based on the age of the mother. Biologically, exceptions can occur, but the program is telling you that it’s possible there is an error in your data because of the mother being less than 16 or more than 45 years old. You can ignore the alert if you are certain the birth date of the child and age of the mother is correct. Or, you may choose to re-evaluate the dates entered in the program to see if there is an error. The default settings shown above can easily be changed, but you first need to know where to look. It is not easy to find. I was a little surprised to see the default Father’s age parameters set the same as the Mother’s. Is it just me?